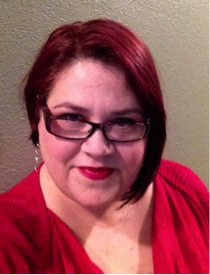 Thank you, Kate Corcino, aka Myra Lang, for joining us for BOD’s author spotlight interview. I’m excited for all of us at BOD to get to know you better! First off, I’ve often wondered how authors come up with pen names and the reasons behind choosing a pen name. Can you tell us about yours? Sure! I initially chose a pen name as a layer between myself (and my family) and the world…except I’m terrible at keeping secrets, so that idea ended quickly. But the name has huge personal significance for me. Kate was the name of my paternal great-grandmother, a woman who I resemble very closely, but who was kind and patient and sweet (basically everything I aspire to be and fall short of!). And Corcino is my maternal grandmother’s maiden name. My ‘Buela was definitely the matriarch of the family—tough and hilarious and loving, and very much the boss. So my pen name is a way to call down some of that feminine energy to me and my career while honoring the women who came before me. That is so cool! What a neat way to honor them. Thank you for sharing. Tell us a little bit about your writing history. When did you know you wanted to be a writer, how long have you been writing, and what was the first story you wrote? I’ve wanted to be a writer for as long as I can remember. I’ve been writing just as long. The first real, formal story that I remember writing was in the fifth grade. I wrote an Anne McCaffrey fan fiction featuring Lessa and F’lar’s son F’lessan. Ha ha! Wow. It’s been a while since I thought of that. I should probably try to find it in my mom’s garage! 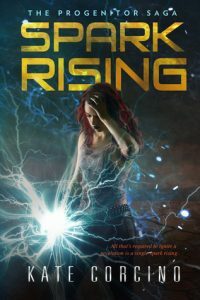 I had the opportunity to read Spark Rising in preparation for this interview. And I have to say that magical/paranormal dystopian stories are some of my favorite kinds of dystopian/apocalyptic stories. Can you tell us where your inspiration for Spark Rising came from? Spark Rising actually just came to me. There was young woman with these strange powers living in an abandoned gas station in the desert after an apocalypse, and she just started talking to me. It wasn’t until I was three or four chapters in that I stopped and plotted out the story. It’s funny—I knew the gas station immediately. It’s a station between Albuquerque and Santa Fe, NM on the edge of Santo Domingo. My husband and I stopped there often when we lived in New Mexico. What was it like being a part of writing Prep For Doom? What did you learn from collaborating with so many authors? Tell us anything you’d like about the experience. It was an amazing experience! I was initially afraid that planning for a project like this would feel chaotic, or that the authors would be in competition, but it was just a wonderfully well-organized, very organic coming-together of ideas. Everyone was supportive and enthusiastic. And I loved collaborating with Casey Hays for our stories—the moments in chat when an idea would come together, like the guitar pick, were gold! It was my first collaboration, but it definitely won’t be my last. All of us at BOD benefited from the awesome experience you had with Prep For Doom. I hope you and many BOD authors have another chance to collaborate soon. Besides Spark Rising and Prep For Doom what other stories have you written or are working on? I have a collection of short prequel stories set in the same world as Spark Rising. It’s called Ignition Point, and it’s offered for sale on Amazon. I’m currently editing Spark Awakening, the sequel to Spark Rising. I’m also writing my first paranormal romance, which is different for me, but I’m all about new experiences. If you can’t have fun, why bother? What other talents or hobbies are you interested in? I love learning practical skills—I knit and I‘m learning to spin. I’m training away my “black thumb” and finally having success with gardening! I love learning about natural remedies. Modern medicine is amazing and certainly has its place, but when you start having to medicate away your side effects, it’s time to take a step back and reevaluate. When you’re not writing, what does a typical day-in-the-life of Myra Lang look like? Chaos! Ha ha ha! I’m a homeschooling mom, so I have my two youngest children at home with me full-time. We school in the mornings, and then they have outside classes in the afternoons, or we do field trips or projects at home. We love making things. They’re finally getting old enough that I can give them instructions and set them loose, so I have the ability to sit close by and write while they work. That’s amazing! I have always admired people who homeschool. It takes a lot of patience and creativity. So, well done! Since it’s summer, do you have any fun vacations planned? If you could go on any vacation this summer where would you go, with whom, and why? We just had a stay-cation because my husband’s time off happened at the same time my brother and sister were visiting from Virginia and Indonesia. My husband and I did go for a day-long trip through the back roads of New Mexico on his motorcycle, and we’re planning a trip to visit family in Houston soon. If I could take my family anywhere…? That’s tough. I’d love to take them on a round-the-world trip so they could experience different cultures and have a sense of history and world communities the way I did growing up. I’d also love to throw everyone in a camper and start driving around the US. Maybe I can plan both someday! Sounds like the realized summer plans and the future wishes would be perfect vacations! Thank you so much for spending time with us at BOD and for sharing a little bit about yourself with us! She is currently working on the second book in the Progenitor Saga after the releases of Ignition Point and Spark Rising, the first books in a near future post-apocalyptic dystopian adventure series with romantic elements, science, magic, and plenty of action. Two hundred years after the cataclysm that annihilated fossil fuels, Sparks keep electricity flowing through their control of energy-giving Dust. The Council of Nine rebuilt civilization on the backs of Sparks, offering citizens a comfortable, powered life in exchange for control of those lives, particularly over the children able to fuel the future. The strongest of the boys are taken as Wards and raised to become elite agents, the Council’s enforcers and spies. Strong girls–those who could advance the rapidly-evolving matrilineal power–don’t exist. Not according to the Council. The life Lena built to escape her past ends the day Alex arrives looking for a renegade Spark. Together they will ignite a revolution that could topple a government conspiracy or push the world back into apocalypse. Good thing Lena Gracey and Alex Reyes feed on pressure–and the electricity.